For our last CRAFT tour of the season we gathered at Ivy Creek Family Farm to see a cost-benefit trial they are performing on three season extension mechanisms on four varieties of salad greens. They applied and were awarded funding from Southern SARE (Sustainable Agriculture Research and Education) to do this trial and were about a little over a month into the project. 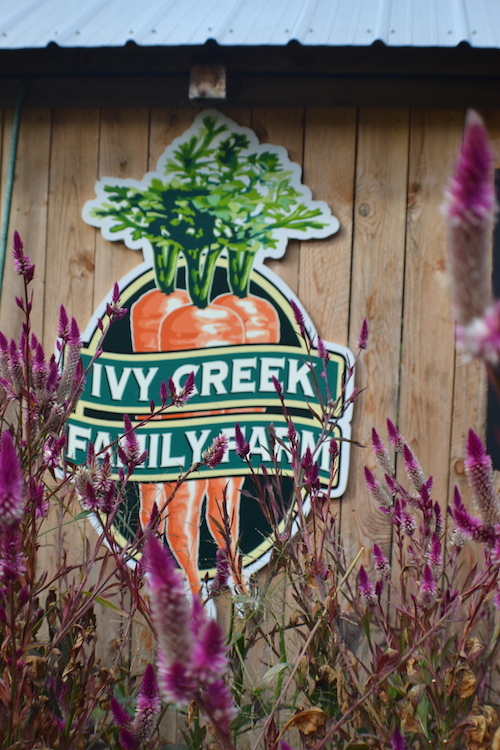 We’ll get into more details in a minute, but first let me tell you a little more about Ivy Creek Family Farm. 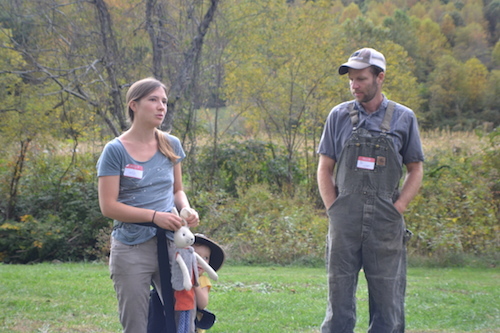 Anna and Paul Littman started farming nine years ago. After farming on leased land for two years they bought their current farm in Barnardsville. They raise annual fruits and vegetables & mushrooms on 6.5-7 acres – three of which are on their farm and an additional 4 acres are leased from neighbors. The farm has grown and evolved over the years and diversification and sustainability have become guiding themes for the Littman’s farm business. Not only do they have diverse produce, but they have diversified their markets and incomes as well. They currently sell their produce through a 75 share CSA, two tailgate markets, and wholesale. 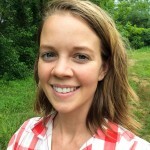 Anna also works part-time, and they experimented this year by hosting a wedding to find other ways to market the farm experience as a way to find the balance in theirfinancial spreadsheets and keep things fun. They do all this with a work crew of 4-5 apprentices each year, with 2-3 working year-round. Now, getting back to Ivy Creek’s season extension experiment. As Paul pointed out, they know how to grow greens, that wasn’t the point. The point of these trials was to see how much time it costs per hour to maintain season extension resources and their efficiency for growing throughout the winter. In other words, they’re trying to figure out if it really is possible to can crank out good produce using quick, temporary season extension structures without having to make a major investment like a high tunnel or greenhouse. 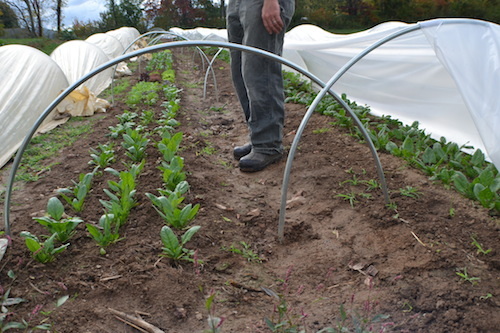 The three season extension methods they are trying include traditional Reemay row covers, greenhouse plastic row covers, and a control plot inside their high tunnel. To create consistent parameters for the trial they started the transplants in the greenhouse on two different dates – August 1st and September 1st – and transplanted those two weeks later. For each season extension technology they planted two rows of the same varieties of greens, and number of plants for each planting. As the greens have grown, Cate, the farm crew leader, will start her stop watch as she harvests each week tracking the time it takes to uncover the row, harvest what’s ready, recover the row, stop the stopwatch, and record her time. Then she will weigh what she has harvested. This way they can compare how each season extension method affects their time efficiency and growth quality throughout the winter compared to a traditional high tunnel. Obviously, Paul pointed out they wouldn’t take the time to do these things if they were really focused on production, but the grant provided them the opportunity and excuse to really study these techniques and methods. The Littmans purchased their Reemay fabric from Mechanical Transplanter in South Carolina where you can order it in any width you’d like, and for their trials used one with a .55 oz and 40F frost protection. For the Greenhouse film the narrowest width they could buy is 14ft. So, they used one piece of greenhouse plastic film to cover two beds. Since uncovering the bed is labor, it makes sense to get a larger piece to cover 2-3 beds so you’re doing the same amount of labor, but saving time. To hold down the edges of the row cover, they use Macro potting soil bags filled with dirt/rocks (a trick they learned at another CRAFT tour!) because they last longer in the sun than any other bag you can buy, and are simpler to move than covering the edges with dirt. For the hoops they use EMT or electrical conduit to keep the row covers off the plants. They currently have no irrigation on the rows, but Paul explained that they would use irrigation if they used these techniques on a production scale. As of yet, their methods hadn’t been tested by cold weather, either. Two other important things to remember with season extension beyond your tools and technologies is your crop and field selection. Be sure to pick crops that are winter hardy, such as carrots that you can store in the ground and get sweeter with more frosts. 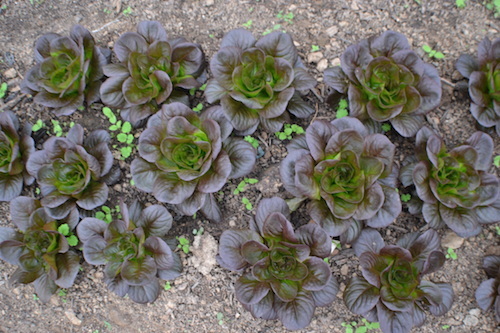 Second, be sure to choose a field with the right soil quality for your crops, i.e. drier soil is better for spinach. After checking out their trials we moved on to their mushroom log stronghold, which the Littman’s also use to extend their season by growing some cold weather strains of shitake mushrooms. The last bit of advice for season extension that Paul gave us, but perhaps the most important one, is to remember to give yourself enough time off so that you don’t burn out come June next year. We must remember not only the financial, but also the mental and physical costs of growing in four seasons. We ended the day sharing yet another abundant and delicious potluck as the sunset turned the surrounding mountains a brilliant gold, and we gathered around the fire pit. Our thanks go out to the Littman’s and their farm crew for welcoming us on their farm and sharing their farming wisdom so openly. A great way to close out the CRAFT season and start to recharge for next year. We can’t thank each of our CRAFT farm tour hosts enough for opening your farms and your willingness to impart not only your successes but your challenges with farming so freely! Your commitment to growing more organic growers is awe inspiring. It’s been a great year of tours, farmer to farmer training, and celebration and we’re looking forward to another one in 2015! Now is the time to join CRAFT for next 2015! 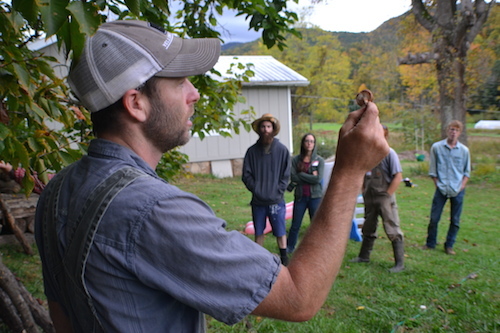 CRAFT is a year-round farmer training collaborative that offers farmers, farm interns, farm employees and aspiring farmers networking and learning opportunities. For more information or to join, click here. Or contact Cameron Farlow, Organic Growers School Farmer Programs Coordinator at 828.338.9465 or cameron@organicgrowersschool.org.